Pain-Chikushodo is the Animal Path controlled by Nagato. The Animal path user is able to summon various animals which often re-spawn again after being killed. During the Pain Invasion, Nagato channeled the Animal Path to one of the Fuma Clan kunoichi, Ajisai who comes from Village Hidden by the Rain. However, there was another shinobi used for Animal Path before Ajisai who hails from Fuma Clan as well. Let’s take a look at Pain-Chikushodo abilities. Ninjutsu Water Style – Foam Scattered Waves: Cause Water attribute damage and 3 COMBO to up to 4 of the opponent’s units, these units will also suffer from Tag. Taijutsu Summoning Jutsu- Rhino: Attack up to 4 of the opponent’s units. This skill is not subject to the opponent’s Defense skills. Taijutsu Summoning Jutsu – Chameleon: Triggered with 10 or more combos, causes Taijutsu damage to 3 of the opponent’s units at random. Ninjutsu Summoning Jutsu -Panda: At the beginning of a battle bring a summon into the field, Summon-Panda, his attributes are based on your own attributes, Pandas have Super Armor. 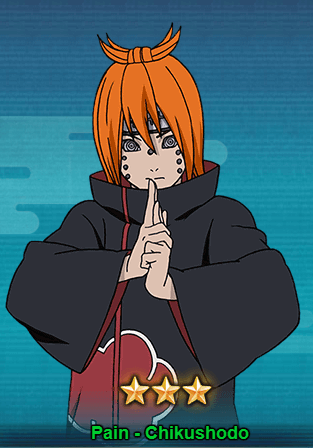 Ninjutsu Rinnegan – Ninjutsu: At the beginning of a battle, all Rinnegan attribute units in your field will have their Ninjutsu increased by 40%, lasts for 3 rounds. You can get Pain-Chikushodo from the Tendo Treasure with 40-60 scroll draws and 3 ninja fragments for 1500 Group Points.